Posted on January 17, 2015	by Katy K.
Here’s a smart, near-ish future sci-fi mystery. Also, Dash seems to be the new literary it-name – this was the first of three books I read with characters named Dash or some variation thereof. 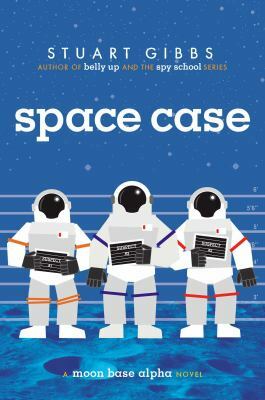 Space Case by Stuart Gibbs. Simon & Schuster, 2014. Dash was very excited to be one of the families living on the moon base – but he’s here to tell that it isn’t all it’s cracked up to be. The food is dreadful and the toilets worse. The space tourist family that lives along with the scientists on the base is dreadfully snobby. And of course, he misses his friends and being able to go surfing. Things take a turn for the sinister when, in the middle of wrestling with the toilet tubing following a particularly bad meal choice, Dash overhears the base’s senior doctor talking excitedly about a discovery he plans to share in the morning. But in the morning, he is dead. While it’s officially ruled a suicide, Dash is unconvinced. Together with his best friend Roddy and the new girl, Kira, he goes against the orders of the director to try to figure out who could have murdered the doctor, and why. They are disturbed to find out how many people might have had something against the genial doctor – but the real answer turns out to be something none of them predicted. Overall, Space Case feels like an old-fashioned “marvels of the future” science fiction novel, with up-to-date marvels and social attitudes. Dash’s family is mixed race, as are nearly all the families on the base. I also appreciated the gender balance in the book: the director of the moon base, while overall an unsympathetic character is a woman, and Dash’s mother is a high-ranking scientist. The pages from the moon base manual inserted between chapters, with their overly-optimistic, yet bland and official attitude are hilarious. The kids are able to fit their adventuring in even as they maneuver around the adults in their lives. But there are a few problems as well. Dash isn’t happy with his situation, and his attitude may come across as pleasantly snarky or unpleasantly whiny, depending on your attitude. As Stephanie at Views from the Tesseract points out, the mystery looks like it’s a closed room mystery that the reader should be able to figure out along with Dash – but it isn’t. There’s no way we can figure it out ahead of time, and that feels like cheating. It might be a bit unbelievable that nearly everyone in the world would be mixed-race by 2040, as this proposes – though I mostly enjoyed reading a world where that’s the case. The final sin is that the cover is boring. This should be a minor sin, but unfortunately, I’ve tried and failed to give this to kids, and put it prominently on display to no avail. Despite my quibbles with the book, it’s a fun story from a much-needed perspective, and deserves more attention than the cover is getting it. More reviews at Charlotte’s Library and Random Musings of a Bibliophile.